Product Preview! South Park, The Stick of Truth Series. An epic quest to become cool. From the perilous battlefields of a small Colorado town, Kidrobot and the creators of South Park bring you five 3-inch vinyl figures ready to undo that which has been did. Featuring the Stick of Truth warriors Stan, Kyle, Cartman, Kenny, and Butters, embroiled in an intense live-action-role-playing game, each wielding his weapon of choice, and dressed to kill underpants gnomes, vampire kids, and hippies. From the fray, a young hero will rise, destined to be South Park’s savior. Don’t be a loser. 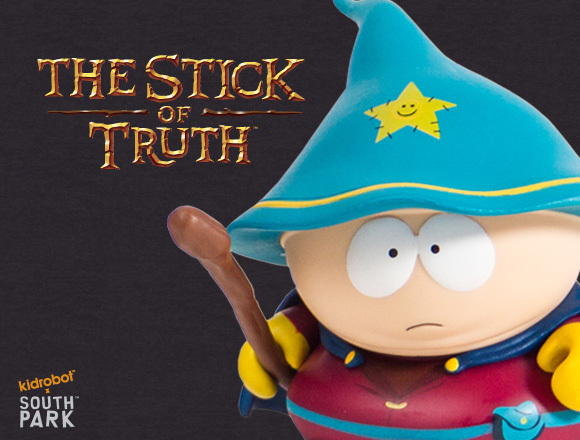 The Stick of Truth begins the game in September 5th at Kidrobot stores, kidrobot.com, and select retailers. Each figure, $9.99 US.